In a saucepan bring honey to a boil. Reduce heat to low and stir in peanut butter. Lightly spray or oil an 8 inch square baking pan with cooking spray. Press into prepared 8-inch pan. When cool, cut into 16 bars. 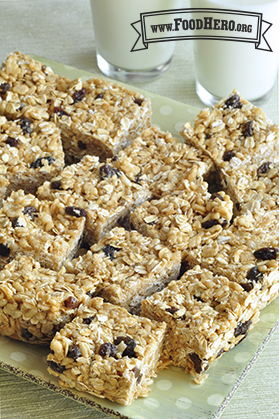 Try this recipe with 4 cups of unsweetened cereal flakes instead of the rice cereal and oats.